Apps for Teachers and Students is a great Livebinder created by user tobyprice. Apps for Teachers and Students include teacher tools, reference apps, storytelling apps, and many apps broken down by subject area. The list of apps found in Apps for Teachers and Students is very comprehensive and each apps is accompanied by the iTunes description pages. This is a great resource and the author has done a fabulous job of putting this list together and keeping it updated. Definitely worth checking out. The EHS Art Department performed well at the Cedar Creek Art Show recently. Our students took home a 1st place trophy in the 2D art category. Jessica Williams received a 1st place prize. Jasmine Lopez and Trey Russell placed 2nd. Seth Purselly, Nathan Cason and Whitney Frosch placed 3rd. Kassidy Cantrell and Keegan Adair placed 5th. In the 3D category, Casey Bramblitt placed 4th and Seth Purselley placed 5th. Congratulations to all the artists who participated for their impressive effort. Wow! 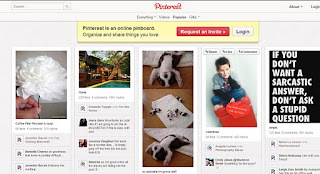 There are a lot of Pinterest pinboards out there, and with so many Pinterest users, this is a must see site: Pinterest: 13 Tips and Tricks for Cutting Edge Users. Don’t forget, teachers, that Pinterest is great for personal use, but it can also be used for instruction to organize unit resources or collect information the class has found. 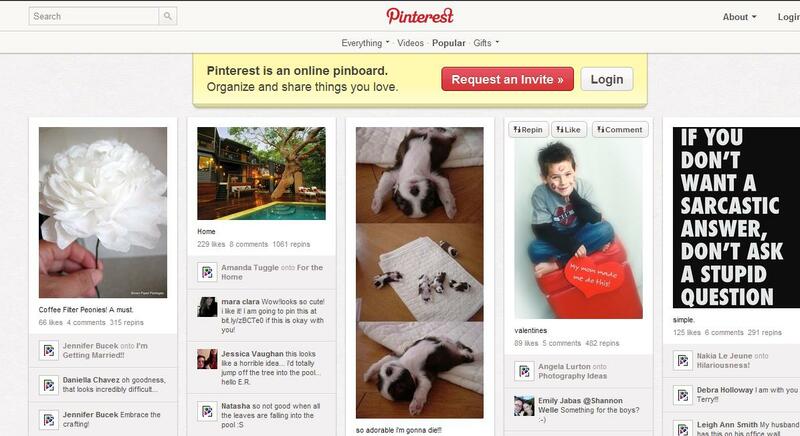 Pinterest may be great for instruction, but be cautious when encouraging student use. Since it allows the user to see all kinds of interesting boards, it may not be the best tool for students to use on their own. So, try Stixy for student use instead of Pinterest. The account is easy to set up using student school e-mails, easier to use than Pinterest, and, best of all, there is no long wait for an invitation. Our seventh graders had been introduced to Stixy as a semester assessment for their Texas History class and enjoyed showcasing their personal work and links. They then easily shared their board to their teacher’s Stixy account by hitting the share button and adding her as a contact. This is a great tool for all kinds of projects! 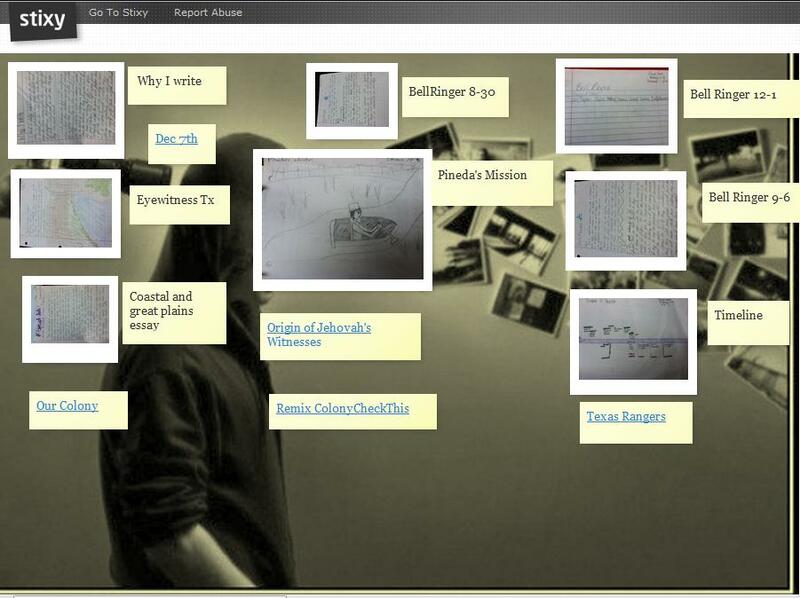 Students used Stixy to showcase work and information as an assessment for the semester. Senior Whitney Frosch shows 'em up at the T.E.T.A Auditions! E.H.S. Senior, Whitney Frosch auditioned Saturday at the Texas Educational Theatre Association Convention with 100 other senior actors from Texas in front of 50 different Universities from Texas and other states combined. When a school is interested in a student attending their university they “call back” a student for interviews. Students are selected for interviews based on their talent, merit, resume’, and the school’s requirements for admission. Miss Frosch received 5 callbacks: Angelo State University, a member of Texas Tech System, East Texas Baptist University, University of the Ozarks, McCLennan Community College, and the very prestigious and finest acting conservatory in America, The American Academy of Dramatic Arts in New York/Los Angeles. Some of the Academy’s alumni include, Robert Redford, Elizabeth Montgomery, Danny Devito, Kim Cattrall, Adrien Brody, Anne Hathaway, Kirk Douglas, Grace Kelly, Lauren Bacall, and many more Oscar, Emmy and Tony awards actors and actresses. Miss Frosch was complimented as being a “leading lady” by the Academy’s representative during the interview. I am so proud of Miss Frosch and the way all of our students represent Eustace High School with poise, class, talent and knowledge. The students even impressed Luis Munoz, Ex-Officio on the Board of Governors for T.E.T.A. and Theater Arts Director for U.I.L. One Act Play Contests with their talent and expertise during a competition with directors & students from other districts. The competition covered the rules for U.I.L. O.A.P. He asked what school we were with and suggested to me they be signed up to be on honor crew for the state meet competition. I remarked, “we intend to be performing at state!” Munoz replied, “see you at the docks!” What a great experience the T.E.T.A. convention and workshop is for our students. We are grateful to be a part of such a wonderful learning experience and appreciate the E.I.S.D.and Board for affording the opportunity to us year after year. Way to represent E.H.S. Theater Arts! Congratulations Whitney! We are Bulldog proud! Author Tammy Beaty-HarveyPosted on January 29, 2012 Categories GeneralLeave a comment on Senior Whitney Frosch shows 'em up at the T.E.T.A Auditions! Apps for Professional Development is a post from the blog, EdReach. Apps for Professional Development is a list that was developed for a school that is beginning iPad implementation. This list mentions apps that the author uses on a regular basis to enhance his own learning. Apps for Professional Development is a wonderful resource. I found it very comprehensive and useful. I ound apps that I have now downloaded and will begin using as well. These students are chosen by vote from all EHS staff members. We are very proud and appreciative of these fine young men and women. If you have not been down around the softball field lately, there have been some major changes made. The first stage of a renovation project has started at both the softball and baseball fields. Right now, our maintenance department is finishing the outfield fence at the softball field. A new scoreboard, sponsored in part by Prosperity Bank, will also be installed at the softball field. Weather permitting, our maintenance department will also install a new outfield fence at the baseball field before the first home game. We are able to do this renovation at a fraction of the usual cost because our maintenance department is handling the construction. Pictures are of the new fence at the softball field. Congratulations to these students on their accomplishments and on their hard work and dedication. The Eustace FFA is sponsored by Zach Tappan and Theresa Tindel.